Kituo involved in Promotion of natural resource management, economic justice and human rights protection along the LAPSSET corridor. Kituo cha Sheria Mombasa office has been working towards raising national and international awareness on human rights abuses related to the LAPPSET and promoting transparency and accountability to its citizens. This has been through conducting trainings on inter community dialogue forums. 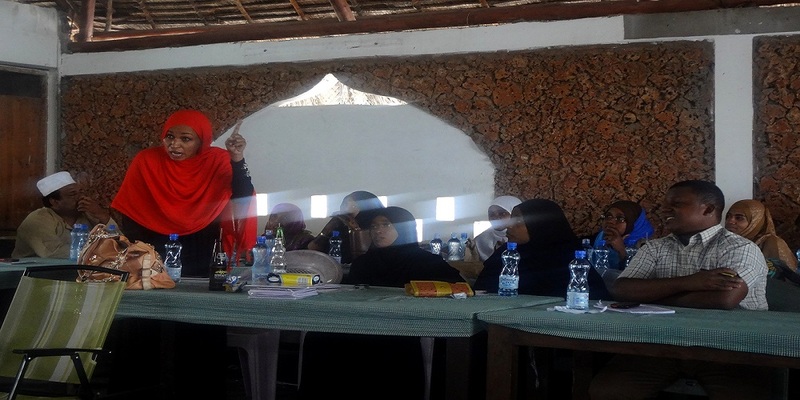 Participants from local civil society organizations (environmental groups, development organizations, youth groups, women organizations, welfare groups, and local communities) who fall under the Save Lamu coalition were involved in the training. 39 were male and 21 were female. The inter-dialogue forum allowed for the community to share their experiences in open conversations and also get a legal interpretation on the same in a simplified mode that is easily understood. The inter community dialogue forums provided the space needed to start crucial conversations that discussed various issues. Key among them in both pate and Amu were the problems that will be caused or aggravated by LAPPSET project, Insecurity issues, land rights, drug abuse, low education levels, weak leadership and health. It also emerged that the importance of women representation in various committees that are formed by the communities to address issues they grapple with was mainly cosmic. The women had no voices in these crucial platforms. Something attributed to the choice of women and also culture. It emerged that the importance of women representation in various committees that are formed by the communities to address issues they grapple with was mainly cosmic. The women had no voices in these crucial platforms. Something attributed to the choice of women and also culture. Poverty emerged to be at the epicenter of all the problems that the community discussed. The recent one was pegged to the survey process that was ongoing and how the locals were selling their land to other people who were not indigenous even in that process. Certain myths about the effects of the LAPPSET project were demystified in the forum. It emerged that there is very limited understanding of the true picture of the Lamu port under the LAPPSET project. It was also keen to note that some of the older members of community are totally opposed to the project until historical injustices are addressed. However the younger ones were able to highlight some of the benefits that will flow to the community with the development of the port. The need for benefit sharing and public participation was also very strongly put across as a role the government needed to play for the community to embrace the port project. On land the lack of titles is still a problem in Lamu. It also emerged that most land committees that were formed to fight for the locals to own land are the same that were giving land to immigrants. This was more so in Pate and Siu areas. The problem is so rife that the parliamentary committee on land had to intervene by coming to the ground but they are yet to give a report on their findings. The issue of the curfew as relates to security was one that was deeply and strongly discussed. The participants were against the curfew as it has affected their source of livelihood which is fishing. The hours that they fish are mostly wee hours of the morning and in the night when the curfew is implemented. The curfew also affected their prayer times especially for the night prayers that begin at 8pm as per the Islamic religion. This was more felt by the mainland people whose curfew starts at 6:30pm. The issue of drug abuse and trafficking was attributed to weak leadership and parenting too. The community said that the traffickers were well known but the leadership and the community is afraid to confront them. This has made the vice rampant. Posted on September 30, 2014 September 30, 2014 Categories Access to Justice, Newsletter Articles, UncategorizedLeave a comment on Kituo involved in Promotion of natural resource management, economic justice and human rights protection along the LAPSSET corridor. Kituo Cha Sheria was honoured a “Distinguished Service Award” by the Law Society of Kenya during its 21st Annual Conference held on August 2014. 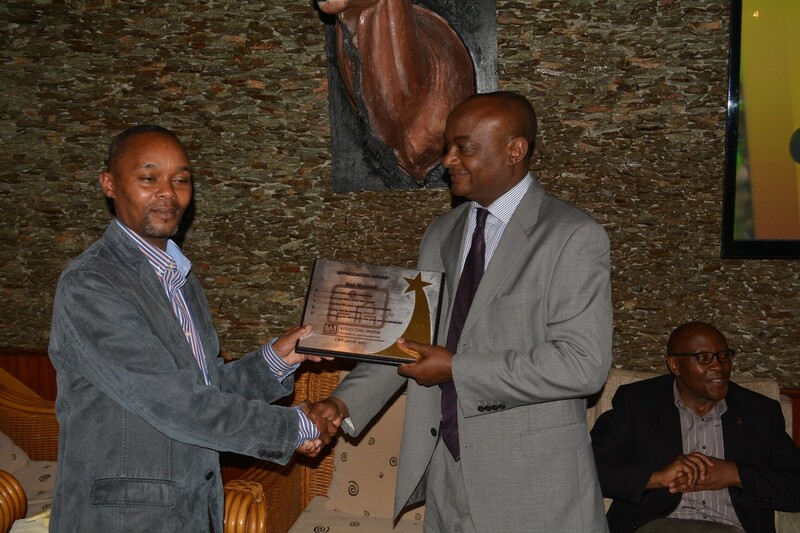 The award was a recognition of Kituo’s continued effort in ensuring “Access to Justice for all”. After receiving the award, Kituo cha Sheria Executive Director Gertrude Angote updated on her Facebook page, “A “Distinguished Service Award” Is indeed befitting and humbling. Thank you all Kenyans for promoting the dream towards “access to justice for all”. Australia Broadcasting Corporation (ABC) TV in partnership with Kituo cha Sheria are producing a documentary on kituo’s paralegal work in prisons and in communities. Sally Jane SARA and Craig Philip BERKMAN from ABC were at Kituo’s head office where they interviewed, AGCP Program Coordinator, Aimee Ongeso and paralegals from kituo’s justice centers as well as in prisons where Kituo has established Justice centres and paralegals over the years. 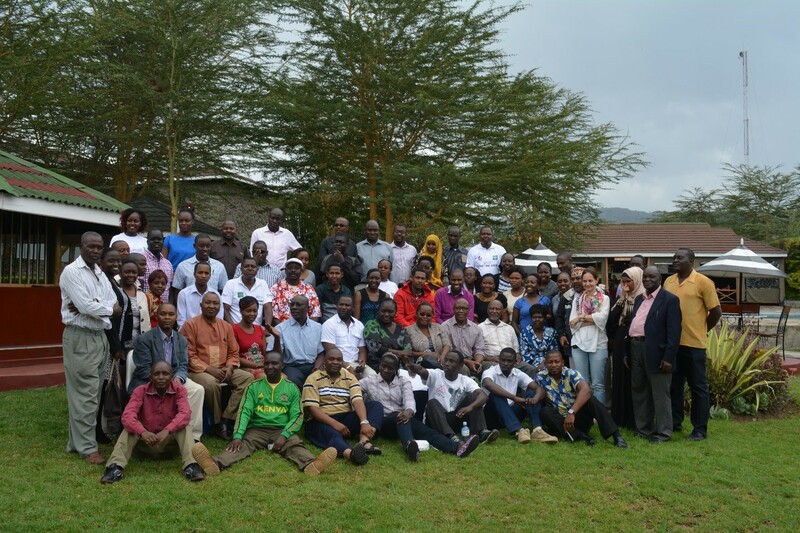 Kituo Forced migration Program conducted a week long training on refugee law at Nairobi University, Institute of Diplomacy and international studies from 4-9th August 2014. The participants who had successfully completed the training on Refugee Law Program were awarded certificates. 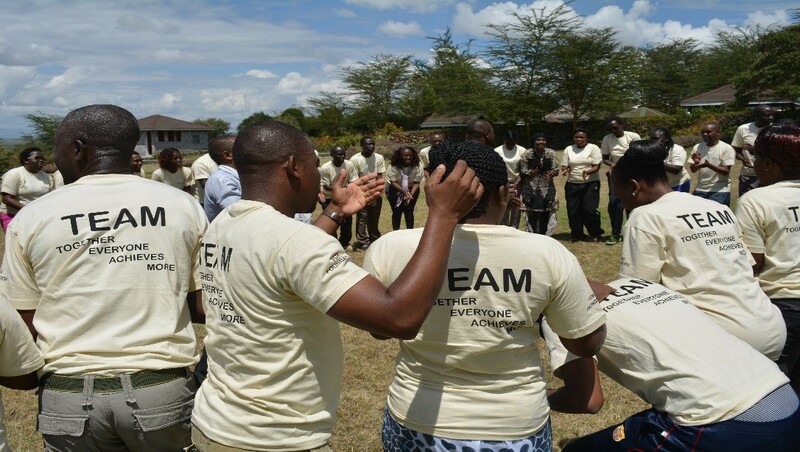 The training was a partnership between Kituo cha sheria-Forced Migration Program, UNHCR and Nairobi University,Institute of Diplomacy and international studies. The partners are planning to extend the training to other universities nationally. Kituo cha Sheria kicks off forums on Sexual Gender Based Violence (SGBV) in informal settlements in Nairobi. Advocacy, Governance and Community Partnership programme (AGCP) has started forums on SGBV in Kibera and other informal settlements. The forums are aimed at empowering people living in informal settlements on gender based violence as well as coming up with way forward on how to deal with SGBV that is mainly rife in informal settlements. The areas of focus are those that were highly affected during the 2007/8 post-election violence. The group is also taking statements that will help them to form the basis of their petition or way forward in advancing their course. 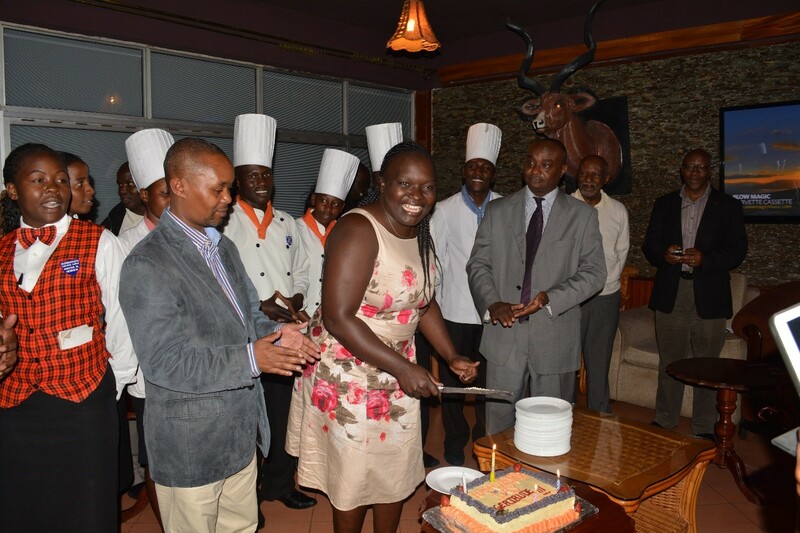 Kituo was honoured to pay tribute our good friend and colleague, Odindo Opiata. He was a well-respected and well known Advocate of the High Court of Kenya and passionate about Social Economic and Cultural rights. He was passionate about his fellow man and devoted his life to the serving others especially the poor and marginalized. He was associated with KITUO since 1999 where he served with various eminent human rights defender. The ongoing trainings on land and devolution in various informal settlements such as Kibera, korogocho, Kamukunji, Majengo, Mukuru kwa Njenga, Dandora and Eastleigh have ignited fresh knowledge on land and devolution among the trainnes. In places where the training had already been conducted such as Eatleigh, Kibera and Korogocho, residents have come up with cases involving land which they want Kituo to do a follow up as they already know their role or in safeguarding either public or private public properties. Marcelino Waithaka of Kituo who has been a major trainer says that, “the training has already born fruits as residents are now more alert on their rights as they have presented to Kituo interests on cases of land grabbing and succession that Kituo has to assist them”. On 20th September, Kituo joined the world in celebrating the international day of peace at Eastleigh high School. From the speakers, dancers, singers and actors, the message was clear that; we all want peace. It was an important occasion where people from all walks of life gathered to observe the international day of peace as it was the case in other parts of the world. There were intriguing performances from dancers, rappers, actors and a football session where the message they were portraying is that we want peace and co-existence not only in Kenya but in the whole world. Indeed, we all have the right to peace.